Helping Aera Energy build relationships with diverse stakeholders and engage key audiences is Cynthia Pollard’s mission. “With a team of incredibly talented people, my work is aimed at helping the company maintain its license to operate in an increasingly challenging external environment,” says Pollard. At Aera, Pollard is responsible for local government relations, internal and external communications and community relations. It’s a role made enjoyable by “the can-do nature of the men and women of Aera” and “the corporate values Aera people live daily,” the Bakersfield native says. Before joining Aera in 2014, Pollard served as president and CEO of the Greater Bakersfield Chamber of Commerce. She has also held positions with Pacific Gas and Electric Company, Bakersfield College, Kaiser Permanente and the Walt Disney Corporation. From 1993 to 2009, Pollard’s public relations firm served a broad spectrum of clients in the private and public sectors. 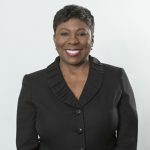 Pollard earned a master’s degree in Public Administration from the University of La Verne and a bachelor’s degree in English from the University of Southern California. In addition, she holds a crisis communications certification from the Institute for Crisis Management and is trained in the nationwide Incident Command System. Pollard has served on the boards and committees of numerous community organizations.